End the year on predictive insight that will support your planning for 2018. 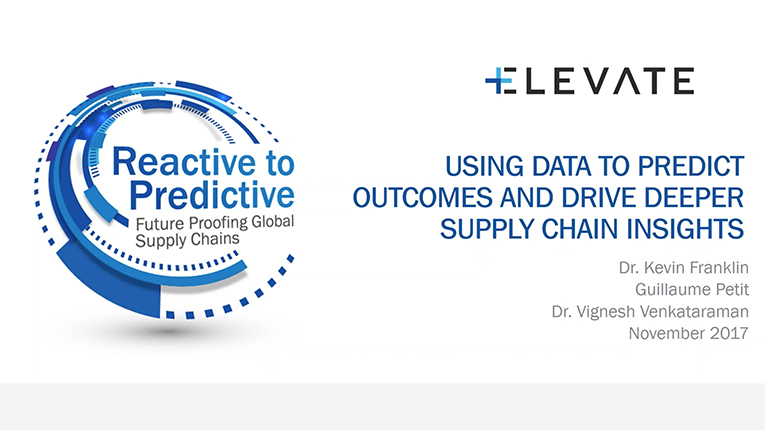 ELEVATE welcomes you to the final webinar in its 2017 Leadership Series of events and webinars framed around this year’s theme of Reactive to Predictive: Future Proofing Global Supply Chains. In this webinar, ELEVATE presenters Dr. Kevin Franklin and Guillaume Petit take a deeper dive into analytics, risk assessment and the company’s drive for data quality and data confidence. This will include insight into source country trending, scorecards and the combination of different data-sets e.g. from audit, quality, worker engagement, eLearning and more. The ELEVATE team will take a closer look through a series of country and sector case studies. This includes how risk indices, program analysis, supplier segmentation and predictive analytics can generate business improvement for different sectors in 2018. These insights also activate and empower workers, factories, suppliers, brands and retailers using the imperative of business driven sustainability that improves margins alongside worker conditions on the factory floor. Join Kevin, Guillaume and Vignesh on 29 November to learn more about scorecards, platforms and data analytics that provide foresight into emerging trends.